What the evidence tells us. Our team has decades of experience studying standards reform. Find new insights from our current research studies or dive into our knowledgebase through our collection of briefs and reports. Explore featured publications below, or visit our archive to search our library of research. 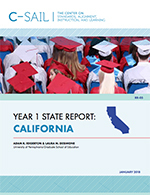 This research article examines standards implementation through the lens of state, regional, and district leadership relationships.